This historical note was written by our founder, Charles Trubshaw C.A. (S.A.)(1936-2015), and his wife, Jose, and they cover the years 1966-2000. The period from 2000 onwards will be finalised by Rodney Trubshaw CGMA ACMA MSc BComm, who joined the company then and is now its CEO. Jose Trubshaw, our founder’s wife, has been part of the team from our inception and has been fantastic in keeping the team together. The history goes something like this! In 1966, I, Charles, had our company incorporated in South Africa and named it Shawson Engineering Transvaal (Pty) Limited. We took offices in Braamfontein, purchased a 2nd hand, extremely heavy, very ancient safe called a Patent Ratner, and then set about finalising product lines which we prayed might sell! These were roofing fasteners consisting of galvanised hook bolts, roofing screws and hook nuts with hot-dipped galvanising envisaged as required. Further lines would be lawn mowers and blades, blackboards and easels, air-pump compressors, artificial Christmas trees, portable LP gas equipment, toilet chemical (with a toilet hire company in due course), and plastic site sanitation with their seats and sanitary pails. With the toilet chemical we received orders for anti-freeze which was used at an Antarctic base to keep their toilets flushable! In later years we marketed underground recirculating toilets, as in aircraft, and a much wider range of products. The first of our major mistakes was that we were completely under-capitalised and should have raised some millions of Rands as standby finance to see us over the formative years. Almost every product line we offered was a complete failure and some of the worst problems were theft of our stock in trade following break-ins, weak marketing, distribution challenges, language problems and fierce competition encountered in the market place. It was extremely difficult to understand the many languages spoken in South Africa and the prevalence of many kinds of theft was a constant drain even allowing for the help of numerous very efficient insurance companies who softened the blow. By the mid 1970s matters were further complicated by increasing military commitments, and I decided, when caught in a think tank on an airfield in South West Africa, that I should eliminate the company and set up and start again. So, that’s what took place and our activities were downsized, the hook-nut machinery was sold, and we re-equipped ourselves to only manufacture plastic products. We had also abandoned our efforts to sell our products by printed pamphlets. Earlier we had set up an in-house printing works where our sales literature was churned out continuously and passed by our marketing department to the South African Post Office for their attention. Unfortunately this form of marketing also failed as the Post Office became impossible to use. Rodney Trubshaw then decided to introduce us to the computer age and initiated our brilliant web site, which has often been voted one of South Africa’s best. The company has progressed very strongly following computerisation but has also profited from our determined efforts in the tele-marketing field. We have had no sales representatives since the early 1990s and rely on our communication systems instead! Thus, we have been able to sell off our fleet of salesmen’s vehicles! By marketing some unusual products, we have had a lot of fun. Success with our recently launched Baboon/Monkey proof refuse bins, either pivot or stationary, and our plastic pet hyena baths, are cases in point. Nothing daunts us or comes as a surprise! Our products are surviving in the tough conditions at the bottom of gold mines, some 4,000 metres deep, our portable toilets were in use on the top of the Hillbrow Tower and our surveillance equipment continues to provide security in the diamond mines along the Skeleton Coast. Some events are quite amusing but the South African authorities try to stop any corners from being cut. On one sales visit to Central Africa, the writer, Charles Trubshaw was being shown some ivory bangles on the Copper Belt and the trader invited him to settle future bills by paying with silver sleepers, which turned out to be earrings much favoured by the ladies of Central Africa! The history continues and we have certainly scaled some of Africa’s highest mountains. For over 50 years, the many people who have helped us cannot be forgotten, the present young team which is nursing the company are doing famously, and finally, it is certainly true that South Africa’s population is the world’s friendliest and its economy perhaps the world’s most interesting. 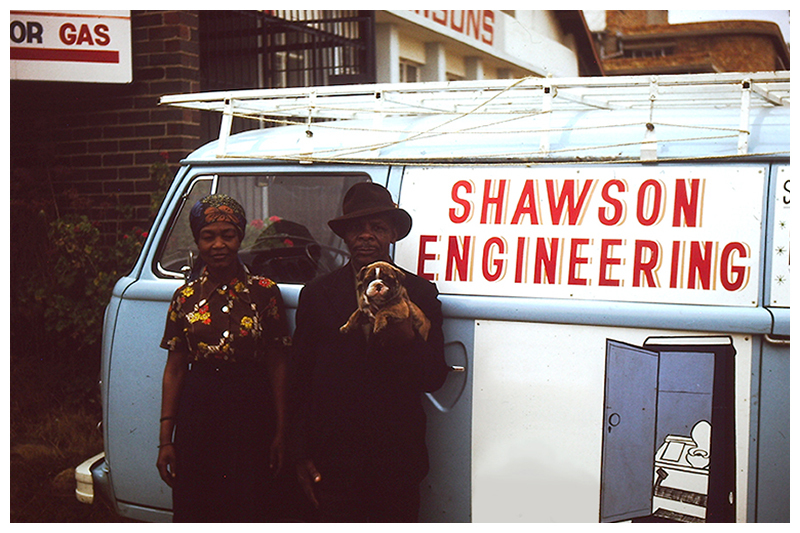 Shawson Premises and delivery vehicle in the early 1970’s. In picture is Willy, Charles’s partner in the early years, and his wife.